Stand up and type more comfortably with the adjustable height & angle WorkEZ Keyboard Tray. 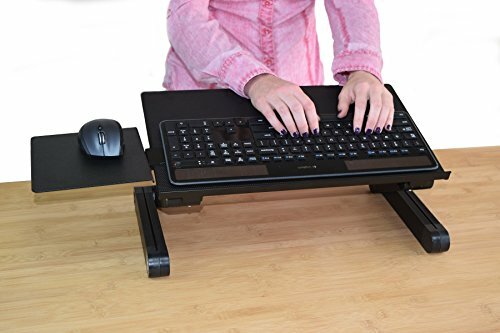 This ergonomic stand up keyboard riser properly positions keyboards and mice to optimize your typing posture. Raise keyboard to elbow-height and type with a neutral or negative tilt for optimal wrist health. Excellent as both a seated and adjustable standing desk keyboard tray, it’s a simple, convenient way to elevate and tilt keyboards for a more comfortable typing experience. * Wide Panel: Approx. 18" left-to-right by 11” front-to-back panel comfortably holds most keyboards and gives ample room for wrist support. * Negative Tilt Panel rotates and locks in 15-degree increments, letting you type with a flat- or downward-angle for optimal wrist health. * Adjustable Height Position keyboards at almost any height from flat on your desk up to ~18"" high - perfect for standing. * Material: Lightweight, durable aluminum. The WorkEZ Keyboard Tray & Mouse Pad is an ideal adjustable, ergonomic computer keyboard stand that elevates keyboards to a comfortable typing height and has a tilting panel for enhanced typing comfort. It’s the perfect standing desk keyboard tray & a simple, effective keyboard stand that can improve your posture and comfort when typing. The WorkEZ Keyboard Tray was designed by and is exclusively manufactured by Uncaged Ergonomics. We work hard to innovate useful, affordable and effective ergonomic office products and welcome your feedback. ADJUSTABLE HEIGHT KEYBOARD STAND: Raise keyboards to almost any height from flat up to 18" tall! The ideal adjustable height stand up computer keyboard holder. NEGATIVE TILT KEYBOARD STAND: tilting keyboard tray makes it easy to adjust your typing angle in 15-degree increments for a neutral or negative tilt to optimize wrist health. ADJUSTABLE MOUSE PAD: Large ~7x7" mouse pad easily and quickly connects to either the right or left side. Mouse pad angle is adjustable independently of the keyboard tray's angle. If you have any questions about this product by Uncaged Ergonomics, contact us by completing and submitting the form below. If you are looking for a specif part number, please include it with your message.